The Sussex Coast has long been one of the best spots in the UK to target Bass. Increasing Sea temperatures have resulted in more and bigger fish staying around for longer. These are great sporting as well as eating fish and efforts to conserve stocks have resulted in both minimum size limits (currently 42cm) and restrictions/bans on taking fish being imposed. 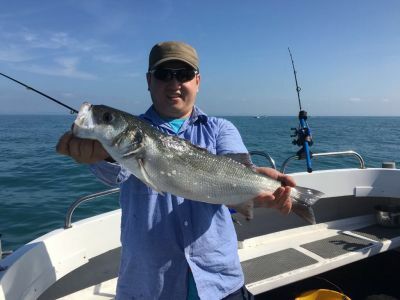 We fish for Bass around the many chalk reefs & gullies in the area and on the offshore wrecks using live-baits, dead-baits & a variety of lures depending on the Sea state and weather conditions. There really is no longer a defined Season for Bass fishing and they are pretty much ever-present along the Sussex Coastline. Please don’t be offended when you have battled with a double figure Bass and we ask you to return it, there are strict rules which govern the taking of this species (Currently 1 fish per angler/day from 1st July and a no take restriction prior to that) and these regulations are strictly observed. When the tides are right we run shorter evening sessions in the Summer/Autumn for Bass from 1700-2100. These can involve float fishing live baits over the reefs, casting lures from the boat or targeting inshore wrecks with live baits/lures. It’s a good option for those that have limited time and ensures that you get the very best of the tide.